The 15,000 CWA workers at AT&T West are working without a contract after their collective bargaining agreement expired on Sunday. CWA had a message for the crowd at AT&T Park in San Francisco for the start of the baseball season. Photo courtesy of CWA Local 9410 Vice President Roland Andersen. "We're going to continue fighting for a fair contract while we stay on the job," said CWA District 9 Vice President Tom Runnion. "For weeks we have called on AT&T West to get serious about bargaining and negotiate a fair agreement for its workers. Our members showed their determination to achieve a fair contract with over 95 percent voting to authorize a strike if necessary. That remains an option." AT&T is a very profitable company and its $49 billion purchase of DirecTV closed last July. However, in bargaining for the workers who have helped make it successful, AT&T is demanding outrageous concessions. CWA members are mobilizing across District 9, putting the company on notice that they're serious about getting a good contract. Negotiations cover workers at AT&T West in California and Nevada. 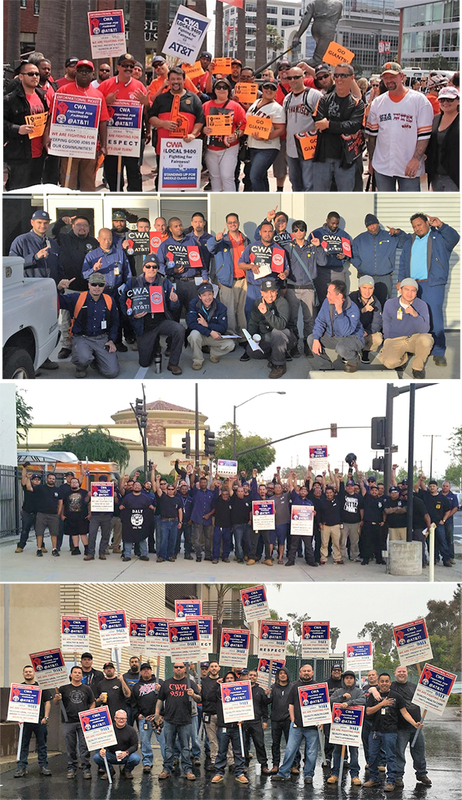 CWA Local 9511 members stand strong in Oceanside.